Toyota Corolla Performance, Engine, Ride, Handling | What Car? 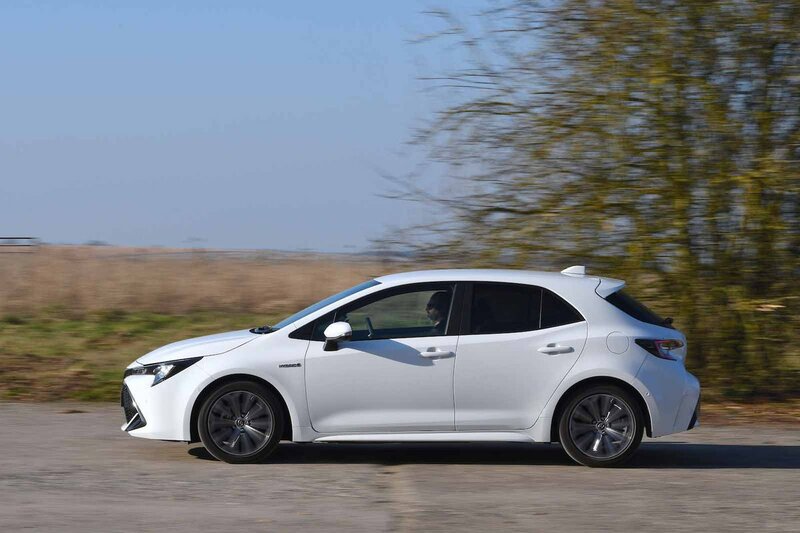 Although there is a conventional entry-level 1.2-litre petrol in the Corolla line-up, Toyota reckons more than 90% of buyers will choose one of the two hybrid models. The 1.8-litre hybrid has a relatively modest 120bhp. It's noticeably slower than a VW Golf 1.0 TSI 115 but acceleration is still adequate in most situations – even when joining motorways. The only time you’ll really wish for a bit more oomph is when you need to overtake dawdling motorists on country roads. Fortunately, the 177bhp 2.0-litre hybrid is much punchier and responds far more eagerly when you squeeze the accelerator pedal. It’s far from a hot hatch but is definitely better suited to outside lane motorway driving, making swift progress altogether less stressful. Fancy a bit of pampering? Well, forget the spa and buy yourself a Corolla instead, because, along with the VW Golf, it's one of the most comfortable cars in the class. It has softer suspension than, say, a Ford Focus, so it smoothes off the rough edges of road ridges better, and transmits less fidget on a patchy section of motorway. True, the pay-off is a little more body bounce along undulating roads than you get in some rivals, but the majority of buyers will think this a small price to pay for its comfort advantages. When driven in a leisurely fashion, the Corolla handles well enough. The steering is pretty accurate and builds weight in a predictable and reassuring fashion. There’s a decent feeling of composure as well, providing you don't expect really quick changes of direction. 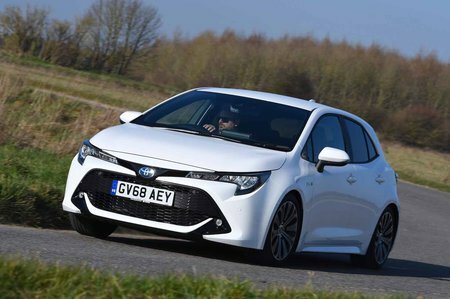 When you start to push harder, though, you notice that the Corolla is less keen to tuck its nose in to corners than a Focus or even a Golf, running out of front-end grip sooner. Put simply, if you want a car that’ll have you grinning on a challenging road, there are better options. Otherwise, you’ll have few complaints. One great thing about hybrids is how hushed they are when you’re just pootling around town. Because the electric motor can manage on its own in stop-start traffic, progress is virtually silent and the petrol engine doesn’t spoil the peace too much when it does cut in to provide assistance. On faster roads, though, particularly those with inclines, the petrol engine begins to whine away noticeably. The blame for this lies with the Corolla’s CVT automatic gearbox, which causes engine revs to soar abruptly during moderate to hard acceleration and stay high until you reach cruising speed. This issue is more pronounced in the 1.8 than the punchier 2.0-litre. 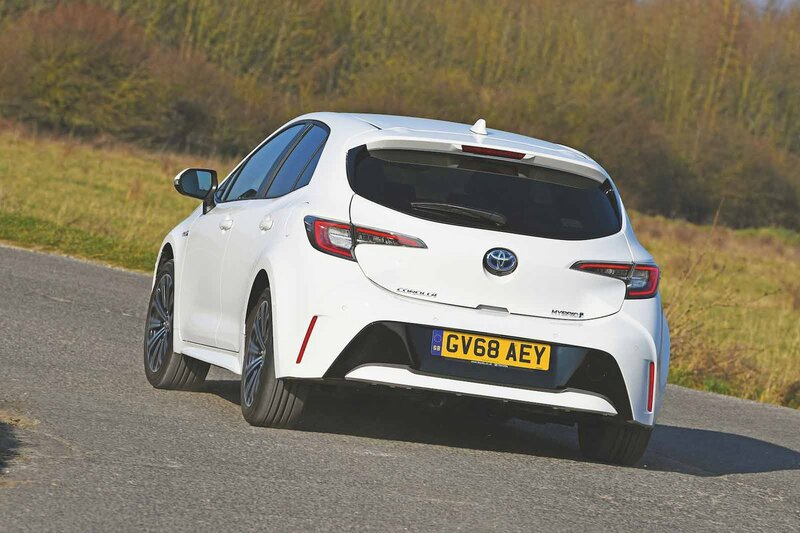 Tyre and wind noise in the 1.8-litre aren't as well suppressed as they might be — the Focus is noticeably more hushed at a steady 70mph. The 2.0-litre hybrid is better, though, benefitting from 'acoustic' side glass that seals out noise better. Regenerative brakes (all hybrids and electric cars have these) can make it tricky to slow your progress smoothly. The Corolla's brakes are less grabby than most hybrids, though, and you can generally draw to a halt gently without jerking your passengers.